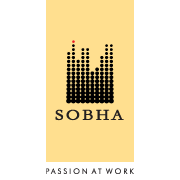 Sobha Developers Ltd is a company with the motto of inculcating passion at work and delivering the best to its clientele. Set up in the year 1995, the company has been engaged in high-quality construction of residential, commercial and corporate projects. The company has developed its projects at 24 cities in 13 states across India. Apart from high-end, fully-developed projects, the company also offers residential plots to its customers for creating and designing the house of their dreams as they like it. Accredited with OHSAS 18001:2007 and ISO 14001:2004 certifications the company has been following superior business ethics in the environmental, health and safety management systems. Sobha Developers Ltd adhere to international standards in every project they carry out and have won accolades for the same. Some of their achievements are the awards for ‘Builder of the Year’ and ‘Most Reliable Builder Award’ by CNBC, ‘Top Indian Real Estate Company’ by Dun & Bradstreet, ‘India’s Top 10 Builders Award’ by Construction World and then some more. Awarded with the Lifetime Achievement Award by the prestigious news/media giant NDTV and the Pravasi Bharatiya Samman Puraskar’ conferred by the Government of India, the Chairman of the company Mr. P.N.C. Menon has to his credit vast experience in the real estate market. It is under his guidance that the company has been able to gain such standing in the realty market.